Vembu offers an additional data protection to the businesses of any kind by allowing the service providers to copy the backed up data to the Vembu cloud residing on AWS. 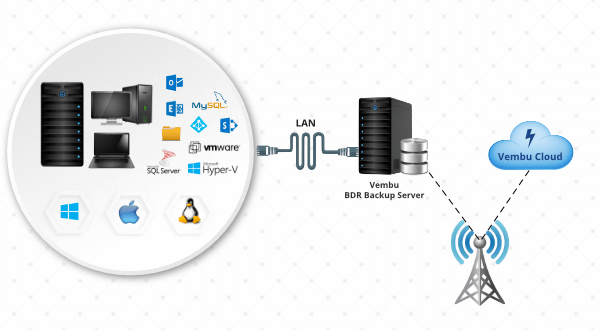 Using Vembu CloudDR, the backed up data of their clients will be replicated directly from the BDR server to the Vembu Cloud as a redundant copy. With this option, the service provider can now safeguard the data of their customer in a highly secured Vembu cloud. They can restore the replicated data directly from the Vembu cloud in case of backup server crash or hardware failure, anywhere anytime with minimalistic downtime. It is difficult for a service provider to restore the data of their trusted customer, if the backup server containing the critical data of their customer got corrupted or the hardware of the backup server got failed due to any disaster. Vembu CloudDR works as a secondary storage unit to safeguard the replicated data from the Vembu BDR server.